The American Women’s Hospitals in World War I France: "Across Battlefields and into Villages" | Doctor or Doctress? 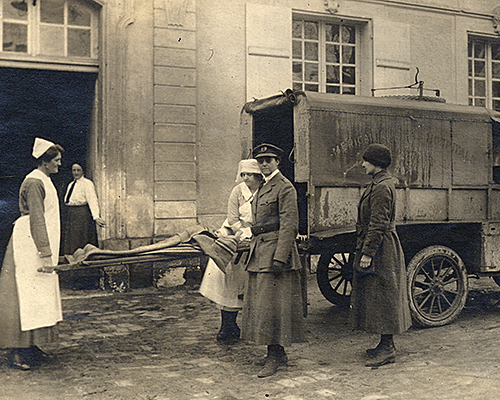 The American Women’s Hospitals in World War I France: "Across Battlefields and into Villages"
This story showcases the civilian relief work of the American Women’s Hospitals in France near the end and in the aftermath of World War I. The records provide valuable insight into the effects of the Great War on French civilians and their villages. The AWH was established to give female physicians, who were barred from serving as official army doctors, an outlet to use their skills to serve in France, and it was one of many paths forged by American women to take action during the war. Although this story's Essential Evidence is comprised of five written documents, these sources may be augmented by the images featured in the "Related Primary Sources" section. Potential opening activity: Locate the towns of Neufmoutiers-en-Brie, Luzancy, and Blérancourt on a map of France. Watch an animated map of front lines to identify where their bases were in relation to the front lines of the war, and ask students to hypothesize the effects this may have had on the people who lived there. Later, students may evaluate their predictions using evidence from the documents. Have students spend five minutes researching the names and dates of some major events in World War I. Create a timeline of what they found on the board, then modify the dates as if the war was taking place in the present day, so that the latest date is in the current year (e.g., if the cease-fire moves from 11/11/1918 to 11/11/2018, Ferdinand's assassination would move from 6/28/1914 to 6/28/2018). If this war had been happening around them today, how might it have interfered with their lives? How many of them have needed to see a doctor in the last 4 years? Using Dr. Hunt’s report from AWH No. 1 in Luzancy, France, students will work with a group to create a chart listing, on one side, the struggles faced by the French civilians and the obstacles faced by the AWH in their work, and on the other side, the causes of each of them. Use specific evidence from the sources to write a letter as an American doctor post-WWI to the President of the United States evaluating the work of the AWH in France, with a recommendation to keep, amend, or eliminate the rule prohibiting women from serving as military doctors. Were AWH efforts sufficient to meet the needs of the French civilians after the war? If they were able to expand their services, what else should they have addressed? How were the AWH doctors regarded by the French people? What kind of resistance did they encounter? If military officials with authority over the policy forbidding women from serving as army doctors saw these documents, how might it have affected their views? Would they have altered the policy? Female physicians were not permitted to hold officer positions as army doctors in WWI. How have things changed since then? Do all genders have equal opportunities to serve the military today? "On a Demographic Consequence of the First World War." Guillaume Vandenbroucke. Vox. Center for Economic Policy and Research. 21 August 2012. Accessed 3/10/2017. Essay evaluating the effects of the war on the populations of the countries that fought, with an emphasis on birth rates. The piece may be overly technical to use in its entirety with students, but the analysis of the war’s effects on the behavior of individual families is compelling and may be useful alongside the AWH sources. "Life in the Zone Rouge." Featured in online exhibit: Anne Morgan's War: Rebuilding Devastated France, 1917–1924. The Morgan Library & Museum. "Public Health Department and Medical Work." From the Anne Morgan film collection of the Franco-American Museum at Château de Blérancourt. Accessed via CNC French Film Archives.